Celebrity couples get engaged all the time, and one of the first things star-watchers do is to take a gander at the finger bling involved! Gossip columns and Hollywood-centered blogs typically discuss how big the stone is, who designed the ring…and what kind of setting it has. In recent years, the trend seems to be pointing towards the halo setting (pave diamonds encircling a bigger stone) for newly engaged stars. Let’s take a look at some of the celebrities who favored the halo-set engagement ring, both onscreen and in real life. The former “The Simple Life” reality star wanted something not-so-simple on her finger when she got engaged to Joel Madden. It didn’t come as a surprise that the stylish celebrity worked with designers at Neil Lane to come up with a halo-set engagement ring for herself, but with a unique twist. Hers features a 4-carat central diamond surrounded by an octagonal halo of smaller stones. 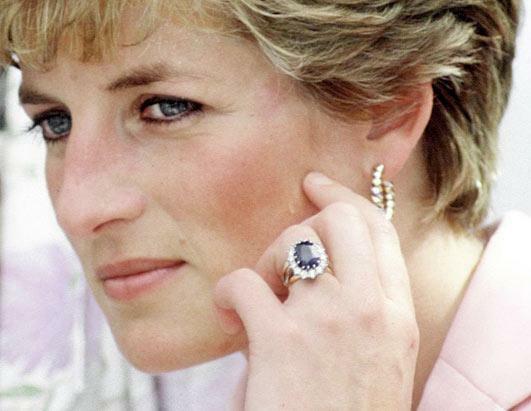 The ring now rests on the finger of Catherine, the Duchess of Cambridge, but in 1981, the 12-carat oval Ceylon sapphire surrounded by a wreath of 14 diamonds once belonged to Lady Diana Spencer. Previously viewed with tragic symbolism in bridal jewelry because of the late Princess’ untimely death, this famous engagement ring went through a positive transformation when Prince William presented it to Catherine Middleton as he proposed to her in 2010. Oscar winner Gwyneth Paltrow wears a prizewinning engagement ring from Chris Martin: a bold yet classy halo-set Asscher cut diamond with an astounding clarity. It’s surrounded by smaller diamonds on a delicate looking wraparound band, and has been pegged by celebrity bling fans as an unparalleled look in rings. Classically beautiful actress Katherine Heigl starred in some wedding-themed movies, so it was not unexpected for her fans to anticipate her own engagement ring. When she finally got it, it didn’t disappoint. Katherine’s three-carat, pear shaped diamond flanked by pave diamonds is a certified stunner.